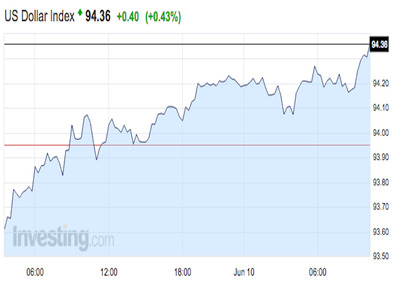 The US dollar index is stronger by 0.4% at 94.36 as of 10:41 a.m. ET. “The US dollar weakened in the first half of the week as participants continued to react to the shockingly poor jobs report and shift in Fed expectations,” Marc Chandler, the global head of currency strategy at Brown Brothers Harriman, wrote. The Canadian dollar is little changed after the Canadian jobs report showed that the labour market added 13,800 jobs in May, above expectations of 1,800, and the unemployment rate unexpectedly fell to 6.9% — the lowest rate since July 2015. The Russian ruble is weaker by 0.6% at 64.7230 per dollar. The currency strengthened earlier in the day up to 64.6032 per dollar after the Central Bank of Russia cut its benchmark one-week repo rate to 10.50%, down from 11%. The Japanese yen is little changed at 106.94 per dollar. The British pound is down by 0.8% at 1.4340 against the dollar amid on-going worries about a Brexit.